I’m so glad to be back. The HoliDaze were truly tiring, and I’m looking forward to a short winter’s nap and spring. Today’s podcast featured an essay from Shanna Moore, who writes the Caffeinated Ponderings newsletter. She’s a wonderful friend and mommy to two beautiful girls. Don’t let the self deprecating manner fool you. She is lovely inside and out. Some music at the end today. I hope you enjoy it! Take a look at the artist and buy their music! Just wanted to let you know that I love your podcast. I’ve listened to each & every one & am always anticipating your next one. I like your mix of talking/stories/music, although I must say that I enjoy your talking the most. Keep up the good work! Hey Meg – Enjoyed the show! I think the idea of working on fabric art of your daughters sounds fabulous, too. I must say I was amazed at the long list of podcasts you tune in to. Wow! The monkeys are very cute, too. Thanks a million for showing me how to download your podcast! I’ve listened to the last 2 and I’m really enjoying them :). I’m thinking about getting a flickr account now too. Oh Meg, you had me laughing while walking laps at the Y, which probably had the other walkers looking at my with suspicion. You lost your iPod AGAIN? Thank goodness it was found! Thankyou for another great podcast. The mix of talk and music and etc is perfect. I just wish you lived closer to the Midwest. To think, I used to live in Sonora, CA years ago, but I didn’t sew then. I just found your podcast…it’s great! I look forward to going back (?) and listening to all of them and to the future podcast. I’m one of those who has podfaded. It’s strange how knowing that what I’ve done has a name is kinda getting me motivated to start again. I’ll keep you posted! Thanks loads for the Whip-It link. That is just my speed in the blog filled world. I totally needed the term “pod fade” so many pod casts that I enjoy have done just that. 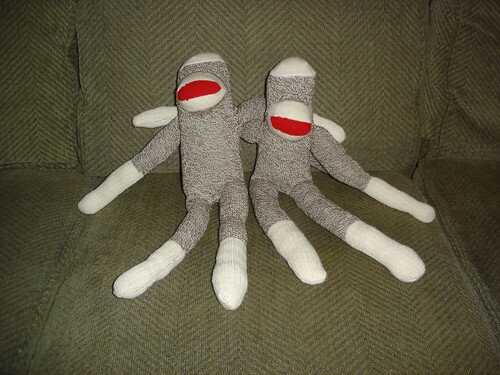 And lastly, thanks for telling us how easy sock monkeys are. They scare me but at least now I’m willing to attempt one. Love the podcast. I’ve been listening at work and longing to be home sewing. Thanks!